(1) Back on December 25, 1969, Morales defended his North American Title against Barend at the Honolulu International Center (HIC). Prior to the match, a group of fans gave Morales a Christmas present of "a gold watch." Morales gave the watch to his friend wrestler Hahn Lee for safe keeping. During the third and deciding fall, Lee staggered out to the ring covered in blood. He told Morales that "They got the watch." While Morales and the referee went to Lee's aid, Barend took out a metal object and hit Morales, knocking him out. Barend then pinned Pedro and won the match. (2) The following Saturday on KGMB TV's 50th State Wrestling show, Hahn Lee told the audience that he was attacked by Ripper Collins and Friday Allman, who took the watch from him. Meanwhile, Collins, Friday, and Barend would appear on TV wearing the watch and teasing Morales and Lee. 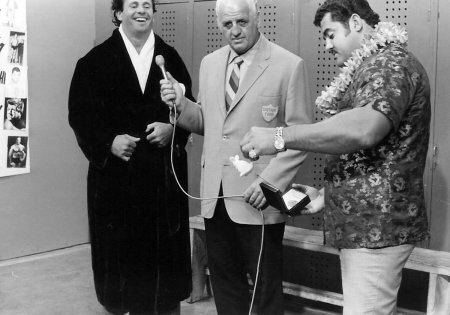 (3) Promoter Ed Francis ordered Barend and Collins to defend their Hawaiian Tag Team titles against Morales and Lee with the condition that if Morales and Lee won, the gold watch would be returned. On March 4, 1970, Morales and Lee defeated Barend and Collins. (4) Finally, on March 14, 1970, during the locker room interviews, Lord Blears stood by as Collins gave Morales a long overdue Christmas present. Johnny Barend stood by with a big smile on his face. Friday Allman is on the left. (5) When Morales opened the present, it contained a toy with a note attached saying "Merry Christmas Greaseball." 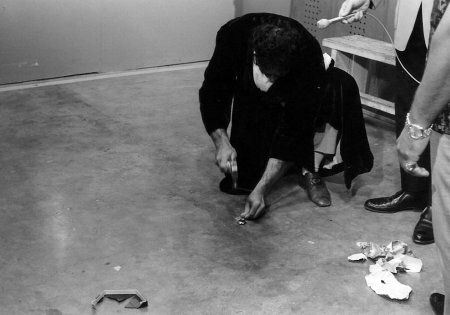 (6) Then Barend pulled out a pouch containing the real watch along with a hammer, lay the watch on the ground, and then smashed it to bits. (7) Morales went nuts and attacked Barend. Pedro had to be separated from Barend by Hahn Lee, Ed Francis, and French Canadian wrestler Rene Goulet. 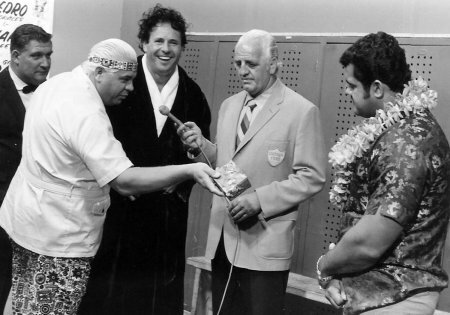 (8) Two weeks later, Morales would meet Barend in a stretcher match at the Honolulu International Center. The loser of the match would have to be carried out of the ring on a stretcher.